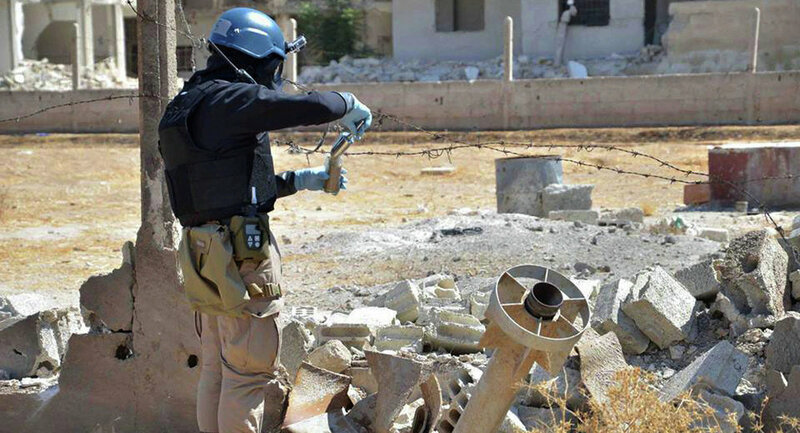 On October 19, the US State Department finally admitted that Islamist insurgents associated with the terrorist group Fateh al-Sham (formerly known as al-Nusra Front) and Daesh had used chemical weapons in Syria. WASHINGTON (Sputnik) – The US-led coalition against the terrorist organization Daesh (ISIS) hasn't commented on reports by the Syrian army regarding their findings of chemical weapons in the Syrian city of Deir ez-Zor, the press office of the Combined Joint Task Force — Operation Inherent Resolve (CJTF-OIR) told Sputnik on Monday. "Please contact the Assad regime or Russian Federation officials to answer your question about this alleged violation of the Law of Armed Conflict," the press office said. The CJTF-OIR added that Daesh terrorists have used "a wide range of barbaric tactics over the past two years, including use of civilians as human shields, use of chemical weapons, use of non-combatant citizens' homes as fighting positions, occupying schools and using them as weapons storage facilities, and converting mosques and hospitals into military bases for terrorist operations." "We are working with our Coalition partners to defeat Daesh and prevent them from repeating these egregious violations of the Law of Armed Conflict," the press office stated. — syria 24 english (@syria24media) 6 ноября 2017 г. A Sputnik correspondent reported on Sunday that the Syrian army had found a car packed with explosives, including chemical substances, in Deir ez-Zor. One of the explosives was marked with an inscription that it contained chemical elements which can only be used in laboratories. The Syrian Armed Forces General Staff announced that Deir ez-Zor had been completely liberated from Daesh.